I was on a return flight from Prague this past summer and found myself studying for a test upon my return to Texas. I was taking a theology online course at Moody and had several hundred pages to pour through before my exam. The lady next to me noticed I was frantically reading and taking notes and generally did not disturb my study. But I guess curiosity overcame her and she broke the ice by asking, “What is systematic theology?” I explained to her what I do and why I was studying Christian theology. She responded by asking, “Do you believe Jonah was really swallowed by a whale?” I have been asked some strange questions in regard to my faith and calling in life, but the reality of Jonah and the whale was one I had not been asked as an initial inquiry into the Scriptures. I answered that I do believe in the infallibility of Scripture and the reality of the events in Jonah. Her response was, “I just can’t believe a book that reports a man being swallowed by a fish and then being spat upon shore.” Our conversation shifted to the gospel for a brief moment, but she could not get beyond Jonah 1:17 and returned to the conversation with her travel companion. I returned to my study of the attributes of God and preparing for my impending test. I was reminded of this conversation as I read about the controversy of Duck Dynasty, the reported discovery and killing of Bigfoot, the myriad of ‘reality’ shows on television. It amazes me that our culture can watch these shows and news events and discern them as truth, yet view scripture as fiction. Stephen was a man chosen by his peers as one whom is well respected, wise and full of the Spirit to lead a vital feeding program in the early church. Stephen was arrested under false pretenses and brought before the council to answer the ‘drummed up’ charges. Stephen gave a passionate presentation of the historical truths of the Jewish people and the truths foretelling the coming of the Messiah, Jesus. The council had Stephen taken from the city and stoned to death. Stephen’s last words were “Lord, don’t charge them with this sin!” Stephen gladly gave his life for a cause much greater than himself, the truth of Jesus Christ. How rare in today’s culture is it to find someone willing to stand for truth and be willing to sacrifice his life for it. I would think that our culture would have a greater problem ‘swallowing’ the account of Stephen more than that of Jonah. I grew up in a very competitive home and culture. Many hours were spent in my home watching football, boxing, the Olympics and listening to the voice of Jim McKay of the Wide World of Sports. We were also involved in little league baseball, pee-wee football, little dribbler basketball, soccer and track. If there was a winner and a loser, we were involved. I was given a modicum of athletic talent and was blessed to win more than I lost, but one summer day brought a humbling experience. I was taking part in the Allen summer track program, Legal Eagles. We would compete against other area track teams and I was slated to run most of the sprints. I had decent speed and could compete in the short sprints or hurdles. One particular track meet the coach decided to try me in the 400 meter sprint (I believe it was called the 440 then). That was fine with me as I enjoyed races that involved speed. I was assigned lane 8, as the 400 is a staggered start, so I started in front of everyone. As the gun sounded, I took off. Not a soul in front of me and I was cruising along all alone in first place. This was a cake walk. As I got to the end of the first straight away I could hear and see others coming up next to me and some even passing me. I tried to ‘dig deeper’ and kick into the next gear to make my move, but I was out of gas. I learned the 400 meter sprint was wrongly named. This was not a sprint, but one notch below a marathon. As we made the final turn I was in dead last place and to make matters worse, lane 8 had the longest path around the turn and I still had to finish the torturous final straight-away to the finish line. Needless to say, I did not win the race and vowed to never run another race that involved any left turns. I was so far behind the others, that the next groups of racers were waiting on me to finish so they could begin their race. Not my best race, but competition has many lessons – Humility being chief among them. Fast forward to the spring of 2008. Our son Payton had been diagnosed with Ewing’s Sarcoma (bone cancer) the year before. He was three. His treatment had been very effective and his prognosis good. He was doing well in the spring of 2008 and we were granted a Make-a-Wish trip to Disneyworld. So all 8 of us and our array of luggage flew to Florida for a week of fun and an opportunity to be somewhat normal again. Part of the Make-a-Wish experience was lodging at Give Kids the World (www.gktw.org), a playground unto itself. GKTW is an incredible place where kids with life-threatening illnesses can come and be treated like kings and queens. Not only are those kids treated like kings and queens, their entire families are spoiled beyond belief. Endless ice cream sundaes, Christmas every week, train rides to breakfast, gifts each day, etc., etc. An experience that brought smiles to faces that had not had much to smile about for some time. We can never thank GKTW enough for the joy and excitement they brought to our family. We learned many lessons while there – Gratitude being chief among them. My competitive spirit has not died, I am just no longer able to play baseball, football, soccer or run sprints without pulling or breaking something. But I have found an avenue that allows me to compete and I hope help those who have helped us. I began running over a year ago to get in shape, but to also compete against myself and the clock. I’m not any better at it than I was as a child, but I enjoy the competitive aspect and the opportunity to reflect, think and pray during my runs. I had set a goal to run a marathon at some point and that point is now. I have signed up to run the Baltimore Marathon on October 12th of this year. It will be a great challenge for me, but I want to dedicate this run to some of the strongest kids and families I have ever met during our journey through the world of childhood cancer. September is Childhood Cancer Awareness Month – these kids are true heroes and they continue to amaze me still. I would also like to run the race in an effort to give another family the same joy we were given at Give Kids the World. I have set a personal goal to raise $1,500.00 in support of GKTW during my run in Baltimore. I would love for you to be a part of that by donating to GKTW through my website, prior to October 12th. Please follow the link below if you would like to contribute. You can see that I broke my promise of never running in races with left turns. Life is like that, we make plans and they change. Sometimes we are in lane 8 and everything looks easy, or sometimes we are in lane 1 trying to chase everything in front of us. It is easy to get frustrated and wonder what I have been doing wrong or what does God have against me. Regardless of the lane, our focus should be on the finish. The trophy has already been paid for and it awaits those who finish the race. Run hard, turn left and keep looking forward. We are often asked why we serve in Europe. I grew up hearing of missionaries in Africa and China since they were the lands of the un-reached and yes they need to hear the Gospel just as anyone else needs to. I seldom if ever heard of anyone serving in Europe. After all Europe was the home of Luther, Calvin, Zwingli, the Vatican, several esteemed universities of Christian heritage and the birthplace of some of the great leaders and missionaries in Christian history. Surely they don’t need missionaries today. If you have spent any time in Europe recently you know the times have changed. The birthplace of the Reformation and the bedrock of Christian heritage has been on a ‘slippery slope’ for some time. Europe has traveled down that slope to a point of compromise, which lead to a time of unbelief which has now lead to a time of outright opposition to anything associated with Christ. (This might sound all to eerily familiar) The majority of churches in Europe are anything but places of worship and the people are left seeking answers in a quagmire of deceit, selfishness and corruption. There are many examples of the people, in our case the Czech people. seeking hope in places that only lead to despair. Click on the link below to read the latest example in the Prague paper. It would be hilarious if it weren’t true. Our family has spent the last three weeks on the road visiting friends in Amarillo, making a stop at Focus on the Family in Colorado Springs, staying with colleagues from Prague in Winter Park, Co and then a two-week stint at our mission headquarters in Littleton, Co. We certainly enjoyed our time traveling but it is always nice to get settled, unpack clothes and sleep in the same bed for several consecutive nights. It was a great two weeks of training and getting to know other families who have been called to leave the comforts of the US and live in a foreign land. We spent those two weeks getting to know the Browns who will be serving in Mozambique, the Channings who will be in Rwanda, the Meekos who will return to serve in Japan and the newly married Lakhanis who will be moving to Uganda soon. What a joy and privilege it was to hear their stories of how God called them and is preparing them to serve. WorldVenture had a program for the kids and they made new friendships that will be eternal. The kids made a video expressing life as a TCK (Third Culture Kid) and I thought they did a great job. It was hard to leave our new friends and colleagues, but we are back in Texas to continue our prayer and partner development so we can return to Prague and our students. TCK Video from reddawg33 on GodTube. We also learned that some of our colleagues in Prague have recently learned that their 11 month-old daughter has been diagnosed with cancer. The Hunt family are American missionaries in Prague serving at Faith Community Church. I’m sure they would appreciate your prayers as they journey a path we are very familiar with. Appointed to what you ask? – Appointed to career status mission service through our sending agency, WorldVenture. When we started this journey in 2006, we committed as mid-term missionaries (2-3 years) with no idea what lay ahead. It has become evident to us that this is what the Lord has planned for us. We are excited, anxious, nervous, overwhelmed and excited again, but before we can return to our ministry in Prague, we have several requirements from WorldVenture (WV) that must be completed. A couple of those are: lots of reading and reports, more training at the WV headquarters in Colorado, some formal Bible courses and increased financial and prayer support. It has become quite clear to us and our supervisors at WV that a June 2013 return date may not be feasible. We will be stationed in Texas until we can complete those requirements. This will make certain that we can return to Prague with a specific focus on ministry and not have to add support raising, classes and other studies on top of our very committed schedule. This was not the original plan, but we have learned that one of the greatest abilities anyone serving overseas can have is flexibility. Thanks for all your prayers and encouragement during our time of interviews and travel to Colorado. 2. Would you pray for our family as we adjust to this decision? Our kids know Prague as home and they have made eternal friendships there. It is hard on them to not be a part of Christian International School of Prague (CISP) and seeing their friends for such a long time. Also, we are currently homeschooling and would appreciate your prayers for direction for the coming school year. 3. Please pray for the ministries we are involved with – Christian International School of Prague, International Church of Prague, Upward Sports-Czech Republic, and Band of Brothers as this creates hardships for them as well. 4. We have been calling for prayer for a new school building and I am happy to report that it appears we will be in a new school building (new to us) for the 2013/2014 school year! We can never thank you enough for the prayers. Also, we recently were able to purchase the entire collection of furniture from a company closing its doors’. Another incredible blessing. Please visit our new and improved school website. Thanks for all your support and encouragement for our family. We arrived at DFW airport about two weeks ago with all 6 kids and all 18 suitcases. We were welcomed ‘home’ by most of our family and were immediately welcomed by the humidity. I put home in quotation marks, because serving overseas and with TCKs (Third Culture Kids), home has a much different meaning. It seems odd, but true, that our youngest three children have lived longer in Prague than in the US. On our first morning back, Marek was watching some TV while we unpacked the myriad of suitcases. I forgot what cartoon he was watching, but he came into the bedroom where we were unpacking and let me know that the show had switched to something else. The carton wasn’t on anymore. I knew very well the cartoon had just started and couldn’t possibly be over. When I entered the living room I realized that the ‘new show’ was a commercial. We don’t have television in Prague and he was completely new to the world of intermittent advertising. Such is the life of global nomads. 1. Take every opportunity available to share with churches, small groups, AWANAs, mission committees, etc., about our calling in the Czech Republic. 2. Get our prayer and financial support back up to the point of survival (more on that later). 3. Begin the transition process with WorldVenture to be full-time/career missionaries serving in the Czech Republic. 4. Keep our kids up on their education as Robin prepares to homeschool Camden (9th grade), Jared (7th grade), Easton (5th grade), Payton (3rd grade), Marek (1st grade), Landry (K). 5. Visit as many family and friends as possible. We would love to see as many of you as possible. •	Our entire CISP staff is in country and ready to begin a new school year. This is the first time we have started the year completely staffed. Hallelujah! •	One of our colleagues (Bill) has agreed to run the 4th year of Upward Sports Basketball as we will be in the states. •	Several of the men at Band of Brothers have stepped up and taken some leadership responsibility to cover the group while we are away. •	We made it ‘home’ safe and sound and have enjoyed a couple of weeks getting acclimated and settled. •	Pray for CISP during our school year away, particularly the senior class and the administration covering our responsibilities. •	Pray that our financial situation will improve quickly. For the first time in several years our support with WorldVenture is in the negative. This will more than likely mean we will not get paid for November and December. •	Also, we need to find new supporters to partner with us in the future. We serve a God who knows no limits and we rest and find comfort in that fact. Pray for the men of Band of Brothers in Prague and for Ben, Tim and Pieter who will be leading the group while we are away. 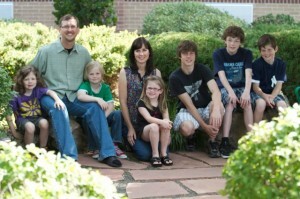 •	Pray for Robin as she will be taking on the primary responsibility of homeschooling the kids while we are in Texas. •	We would also love to find someone(s who would be willing to help us with (a) our website maintenance, (b) our website updates (about 6 a year), (c) mailing newsletters to supporters and partners. If you would like to donate some of your time or expertise, we could sure use you. •	Pray for the heart of the Ministry of Education for the Czech Republic to be changed. We were denied recognition again for reasons that are completely suspect. This does not allow Czechs and many other nationalities to attend our school. 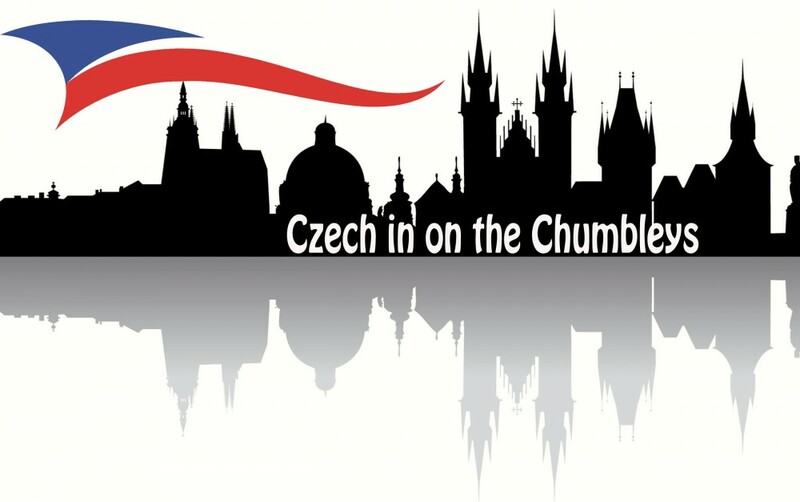 Want to help support the ministry of the Chumbley Family in Prague? Follow this link on the left ‘Support the Chumbley family through WorldVenture’ and join us as we spread the gospel in central Europe. How to get hold of us in the US:. It’s hard to believe that we will be landing in Dallas in about 2 weeks. There is so much left to do, but we are looking forward to seeing friends and family soon. Not so excited about leaving the 60 degree weather here in Prague. We were very honored to have a group from First Baptist Church – Prosper, Texas dedicate a week of their summer to run our 3rd Upward Sports Basketball Camp. This camp is dedicated to the ex-pat kids living in Prague. (We are in the process of beginning a camp primarily for Czechs soon.) Many of these kids are from missionary families and we are often asked why we have a camp for primarily missionary kids? First of all, it is not just for missionary kids. Many of the kids are not believers and not actively involved in church. Secondly, this is our primary mission – working with TCKs (Third Culture Kids TCKs ) and their families. These kids are often forgotten. They don’t often get to visit families in the summer, enjoy a summer of swimming or camping with friends or running around with kids from their own culture. One of the moms made the comment that her son is the ‘only’ Christian in his school and being a part of the basketball camp was an ‘oasis’ for him. He wanted the camp to be longer – much longer. So a big thank you to FBC-Prosper as they made an impact on 30-35 kids who really needed a time to fellowship, have fun and hear the gospel. •	Pray for our transition and travel to Texas on Sept. 17th. There are many details to be taken care of here prior to our departure. •	Pray for CISP during our school year away. •	Pray for the men of Band of Brothers in Prague and for Tim who will be leading the group while we are away. •	Pray for Robin as she will be homeschooling the kids while we are in Texas. Camden (15) – Seeing family, speaking the same language, American culture and eating at Red Lobster. Jared (13) – Seeing family, American food and culture, language and friendly people. Easton (11) – Family, playing ping-pong, candy, stores with stuff and speaking the same language. Payton (8) – Family, Wal-Mart and Chuck E. Cheese. Landry (4) – New pink clothes, birthday party, family and shoes. Robin and I are obviously looking forward to seeing family and friends again. We would love to come speak to your church, missions committee, small group, Sunday school class, etc. We are excited about what the Lord is doing in Prague and would love to share that vision with you. I am looking forward to seeing the faces of our family when we fly into Dallas this fall. It will have been over two years since many of our family have seen us. I’m sure the kids have grown (and unfortunately so have I, European chocolate is a tough habit to break) where they may even be unrecognizable to some of our family. Camden is now 15 and has probably changed the most in the last 2 years. He continues to play the bass guitar at Youth Praha and at the International Church of Prague. He loves music and has inherited a love for 80’s southern rock music. Jared will be 13 in a couple of weeks. Two teenagers under the same roof (of course in 4 years we will have 4 teenagers in the house). There is no way that Robin and I are old enough to have 2 teenagers in the house. Jared plays acoustic and electric guitar and his first is concert before his birthday. He is very talented, but not real excited about playing in front of people yet. I hope this concert will change that fear. Easton will be 11 the day after Jared turns 13. Easton plays the violin, but his passion is sports (I have no idea where that comes from), any sport. He plays basketball and baseball, but really wants to play rugby and floorball. He is truly enjoying school at CISP and will miss his mates next year. Payton is 8 and doing well. He received a small ’kiddy’ drum set for Christmas and has been taking lessons for a couple of months now. We recently attended a church retreat that has a talent show on the last night. Payton wanted to play drums and we somewhat reluctantly said yes. 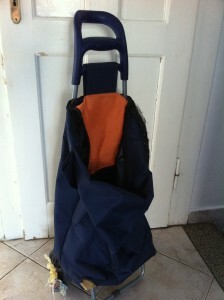 It was an electric drum kit, setup for an adult and we weren’t sure if he would have any idea what to do. He went last and you would have thought he was Ringo Starr (sorry for the dated reference, but I don’t know any current drummers). He played the drum set like he was born attached to it. It was amazing! The place went crazy and no one was more surprised than Robin and me. Marek is 6 and heavily involved in drawing and ‘ciphering’, as Jethro Bodine would say. (Again, sorry for the dated reference, but I am old) He spends most of his day drawing pictures, playing with Legos or trying to solve math equations. He loves to draw maps and super heroes. He is the quiet one of the family, or should I say quietest, since none of us are very quiet. Landry is 4 and she is definitely not the quiet one. She is the boss and if you don’t believe it just ask her. I’ve never seen a little girl get up in the morning, fix her hair, put on a dress, put on her lipstick (lip gloss) and then go outside and hunt snails with the boys. She is the girliest tomboy I have ever seen. She loves hair clips, makeup, dresses, shoes and wrestling in the mud. She definitely keeps us all on our toes. Robin and I enjoy being the parents of 6 very different and unique kids. Robin spends most of her time running a house of 8, which is sometimes a house of 9, 10 or 12. We have had a student teacher live with us again this year and various other travelers stay with us during their time in Prague. We still host a Thursday night dinner for the single guys that work at CISP or are involved at the International Church of Prague. I am the principal at CISP and part-time acting director as our director has been gone most of this semester, we are the directors of Upward Sports – Czech Republic and I lead a men’s group called Band of Brothers each Saturday morning . I would never label our lives slow, but we are continually blessed! -Payton and I will traveling to the hospital this Monday (21st) for his 6 month scans (MRI, x-rays, sonogram, blood work, urinalysis and examination). Please pray for a smooth day as we travel the maze of the Czech hospital and that all tests will show NED. We just passed the 4 year mark. Hallelujah! - We will be traveling back to Texas on September 17th. Please pray for funding to complete payment for our airline tickets. We still need 4 of us to be sponsored at around $1,000.00 each to pay for our tickets. Pray that our time will be fruitful in the states as we share what Christ is doing in the Czech Republic and as we go through the process of becoming full-time missionaries through WorldVenture. We will need additional training, additional prayer warriors and additional financial support for the transition. -We ask for prayers as we transition back to the states. Some of our kids don’t remember the USA and most of them see Prague as home, so the transition will create challenges in their already challenging lives. The life of a TCK (Third Culture Kid) is anything but normal and calm. -We will be in the states from 6-9 months and would love the opportunity to speak to your church, Sunday school class, AWANA group, small group, etc. We are privileged to do what we do and we love to share the vision that God has given us. CISP is completing its 8th year in existence. Eight years of transforming lives for the kingdom. We have seen several students come to know the Lord this year and there is no greater joy in my job than seeing their lives given hope right before our eyes. We are continually amazed by God’s mercy and grace and how He uses these students to spread the gospel to all corners of the earth. Our enrollment continues to hover around 90, as we really have no more room to grow. We have utilized every square inch of space we can. My office is used for 5 different sessions each week; many days I am without a place to work. This is my first year as principal in the sense that it is my fulltime job. I had the title the previous two years, but I was teaching so many classes that I had little time to actually be principal. We have been blessed with an incredible staff and look to be fully staffed for next year. I don’t think we have ever been able to say that in May. Our normal summer months are spent scrambling around trying to fill last minute positions. We are still seeking a building, Czech ministry recognition and ACSI accreditation. All three of those processes are occurring at the same time. -Pray that we will see favor with the Czech ministry of education, so the Czech students can legally attend our school and impact the Czech Republic. _Pray for our committees as they continue to complete the 3 year-long project of collecting information and making changes to meet ACSI accreditation standards. ACSI will be traveling to Prague in the spring of 2013 for an accreditation visit. -Continue to pray for a building that will allow CISP to impact Prague for the gospel and be a radiating center of truth and hope. -Pray for the staff and administration team as I depart for the upcoming school year. My jobs will be shouldered by the experienced staff at CISP for the upcoming year. While the group has changed over the years, BoB, Band of Brothers, has faithfully met on Saturday mornings at the Starbuck’s on Wenceslas Square (the heart of the city) for 4 years. We have seen everything from ridicule to having groups that are traveling through Prague join us on Saturday mornings. We have encouraged, loved, confronted and challenged each other in ways we never imagined. We have become a group of men, although not a large group, who truly want to see Jesus glorified in our lives, in our family and in our adopted city of Prague. We come from various professions, ages, countries and walks of life, but we share a passion to not be men of passivity. -Please pray that we remain committed and strong in the faith and to one another. -Please pray for our brother Sydney who is having marital problems. -Please continue to pray for us all as the enemy is clever in his attacks and wants nothing more than to see us become a social club. We have just completed our 3rd Upward Sports Basketball league and preparations are underway for our 3rd Upward Sports Basketball Camp to be held 25-29 June. -Please pray for FBC-Prosper as they bring a team over to run our 2012 Upward Sports basketball camp. -Pray for the facility to hold the camp. Our primary facility is under renovation and it looks like it will not be ready in time. Pray we can find a location for the camp very soon. -Pray for the kids who will come to the camp. Pray for those who don’t know Jesus to meet him in a real and life-changing way. Pray for those that do know him to strengthen their faith and their boldness in Him. -Pray for Bill Gregory who will be running the 2012 Upward Sports basketball league while we are in the states. We would relish the opportunity to connect with you while we are in the states. If you would like for us to come speak to one of your groups or if you would just like to meet and discuss missions, missions in central Europe or you want to talk about what Jesus means to me, please email me at chumbley@worldventure.net. If you would like to help sponsor the Upward Sports Basketball Camp this summer by offsetting some of the expenses or sponsoring a $40.00 scholarship to help someone attend the camp, follow this link and make a tax deductible donation to WorldVenture and the funds will be directly used for the upcoming camp. If you would like to support our family and mission in the Czech Republic, we would love to have you as a financial partner for the future or a one-time donor to the work in Czech Republic. Please follow this link to become a financial partner or one-time donor. Thank you for your continued prayer and financial support for our family. We look forward to seeing many of you this coming fall and into the New Year. I grew up thinking that the rest of the world must be a lot like north Texas when it came to churches and the Christian faith. That is, everywhere besides Africa and China. It was apparent to me that China and Africa didn’t have a church on every corner with a weekly three point sermon, three hymns (1st, 2nd and 4th verses only) and an offering coinciding with special music and all of this wrapped up with an altar call. I assumed ‘church’ was just like this in Canada, Germany, Brazil and all points in between. I assumed it because no one ever spoke otherwise. After all Europe was the birthplace of the Protestant Reformation. Men like Martin Luther, Jan Hus, John Calvin, John Wycliffe and other pioneers of the faith had blazed a trail that we assumed would never be extinguished. Great missionaries such as Gladys Alward, William Carey, the Moravians, Eric Liddell, and Hudson Taylor, just to name a few, were products of the strong theological and evangelistic teaching of European churches a century or more ago. If that isn’t scary enough, only 1 million of the 10+ million people in the Czech Republic listed Roman Catholicism as their religion and over 85% of them are over the age of 60. Of course, there are no records as to how many of those even attend mass regularly or actively pursue their faith through other means. Over 50% left the question blank, while nearly 10% believe in something, they are just unsure of what. Less than 1% labeled themselves as affiliated with any evangelical branch of Czech churches, slightly more than that described themselves as the religion of Jedis. Why Europe? CISP –Our need for our own building continues to be paramount. We have had several possibilities but something (or someone) always seems to block our progress. We ask that you pray for our desperate need for a building. We desire nothing more that to be a radiating center for the gospel in a city and country that needs to hear that there is hope. We have nearly 100 students this year representing 24 countries. We ask for specific prayer for S and Y, two young men who enrolled this year. Y made a profession of faith while at our Secondary Retreat in the fall and I have the special privilege of being S’s mentor while at CISP. We have had some incredible talks recently as S and Y were recently notified that their parents are divorcing. The mom has already returned to Florida with Y and S is living with dad in Prague. Please pray for someone that will fill the need to disciple Y and that S will continue to seek the truth and that they both will heal through this difficult family time. Upward Sports – We have just begun our 3rd basketball season of Upward Sports basketball in the Czech Republic. We have 50+ participants this year and look forward to another season of establishing relationships that will be eternal. We are also beginning to coordinate our basketball camp(s) for the summer and we are still looking for church groups or individuals who would like to come over and help out. It is a great blessing to our kids and we are always proud to show off our beautiful city. Please contact me if you have an interest in being a part of camp this summer. Band of Brothers – Our Saturday morning men’s group continues to grow both in number and commitment. We have a great group of men who are dedicated to making an impact on our families, communities and world. Pray that we will stay strong and make a bold statement for the gospel in this culture. Chumbley Family – We have been very busy, but we look forward to some rest and time together during Christmas break. Camden – is 14 and plays the bass guitar in the Youth Praha worship team and the church worship team. He recently had his braces removed after wearing them for more than a year. He is in 8th grade at CISP and likes Bible, music and history class. Jared – is 12 years old, plays the guitar (but seldom in front of anyone) and enjoys learning languages, music class and writing as a 6th grader at CISP. Easton – is 10 years old and has taken a hiatus from violin as being a 4th grader has taken more time and energy than he anticipated. He hopes to begin violin again in January to go along with his interest in chess and anything competitive. Payton – is 7 (turns 8 on January 2) and is in the 2nd grade at the Perunova Skolka (Czech elementary school). He loves to play the drums – on everything – all the time. Marek – is 6 and is homeschooled. He loves to draw and create. He can be found at the table or at his art table drawing, painting or building at almost any time of the day. Landry – is 4 and runs the house. She is all girl! She loves her ‘baby dolls’ and anything that is pink or purple. She loves to wear dresses, but also wrestle with her brothers. If you would be interested in being a part of what is happening in Prague, we are always in need of prayer and financial support. We would be happy to send you short prayer requests via email as they occur. Please email me at chumbley@worldventure.net for more details. Thanks for your continued love and support. We thank God for you daily. After 4 years of exceptional service, old Nellie (as she became affectionately known) has had to be put to pasture. Nellie carried the majority of the groceries for our family over that time through snow, sleet, rain and dog poo. She never complained even though she was held together by duct tape, string and glue. As God’s timing is always perfect, the day after Nellie was retired we were finally able to purchase a van for our family and ministries. It is still quite difficult to believe that we have lived in this city this long with only the use of public transportation. We are extremely grateful for those who made purchasing this van possible (as a new VW van can cost in excess of $50,000). 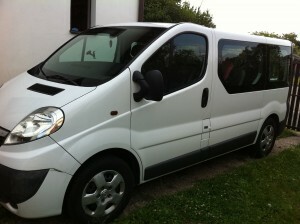 We are now the proud owners of a 2007 Opel Vivaro 9-passenger van. We purchased ‘velka bila’ (big white) from another American family with 6 children who have recently been called back to the states by their employer. Velka bila has a huge scratch down the passenger side, a missing plastic panel on the passenger door, rubber floors and a few extra crumbs compliments of the previous owners. A perfect vehicle for our family. Shopping is now a once a week chore instead of daily one and we are looking forward to a family vacation that we can travel to in our van together. A big (velka) praise for the van. It is a definite answer to prayer. My older sister is in town visiting us for a couple of weeks and one of her desires was to see the US Womens’ Soccer team play in the World Cup in Germany. 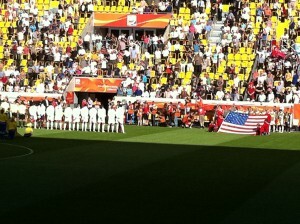 We were able to get two tickets to see the US play North Korea in Dresden (a couple of hours away). Now I am in no way a major soccer fan and know very little if anything about the US womens’ team, but I was looking forward to the trip and spending time with Dana. I was completely taken back by what happened at the game. 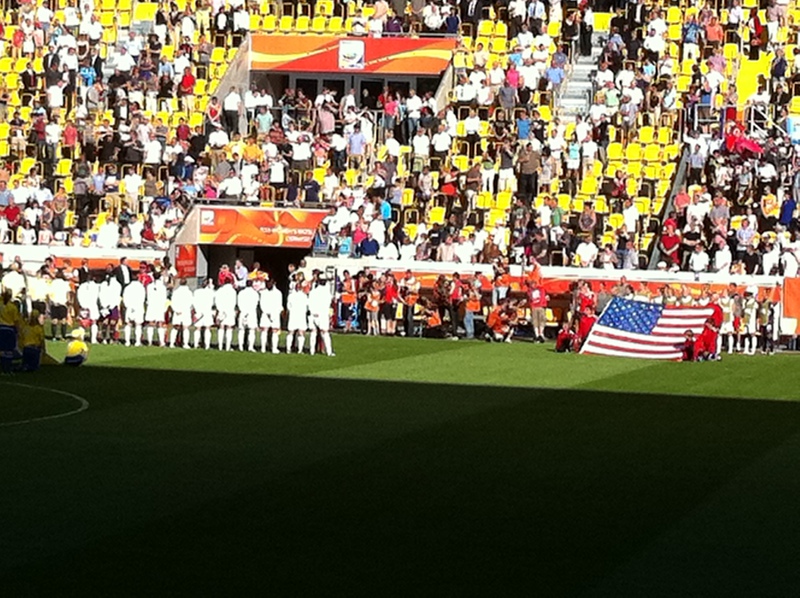 No, not the fact that the US won (as well they should have), but I was totally taken back by the affect singing the national anthem had on me. Sad to say, I can’t remember the last time I sang the national anthem and saw Old Glory on public display at such an event (the last time was probably a Texas Ranger game sometime last year). A wave of patriotism and pride seemed to unexpectedly overtake me. I am proud of my heritage, but singing that song on foreign soil amongst a crowd of people who may never know such freedoms as we possess was such a sudden rush of intense appreciation and inspiration. It is so hard to adequately describe. Of course, much of my nationalistic pride lessened once the American import, the Wave started. CISP – We are having a hectic and busy summer after graduating our largest senior class, 10. We are still in desperate need of our own building. We just agreed to rent another flat for high school classrooms next year. Currently, our elementary classes meet in the Perunova Czech building, our middle school meets in that building as well. The challenge is our high school and business office. Our high school now meets in two separate flats in the same apartment complex three blocks from the main campus and they come to the main building for art, science, PE and computer classes. Our business office is in a separate building a couple of blocks from our main campus. Our administrative team has taken over half of the skolka flat (a skolka is a janitor/maintenance man that lives in the school) to use as offices. Needless to say, the arrangement is less than ideal. We would appreciate all prayers on behalf of this need. Upward Sports – We are in the planning process of our 3rd basketball season and need coaches, refs and supplies. We are also beginning to coordinate our basketball camp(s) for next summer and we are always looking for church groups or individuals who would like to come over and help out. It is a great blessing to our kids and we are always proud to show off our beautiful city. Band of Brothers – Our Saturday morning mens group continues to grow both in number and commitment. We have a great group of men who are dedicated to making an impact on our families, communities and world. Pray that we will stay strong and make a bold statement for the gospel in this culture. Chumbley Family – We are going to enjoy a short vacation in Austria this August. This will give us a chance to visit friends in Graz, Austria and do a little historical discovery as well. We are excited about taking this time together as a family. It has been a very busy school year and we pray that all of our staff will be granted visas and be here on time as this will alleviate a lot of stress and strain on our staff and their families. Our family included. It is our desire to spend more time together as a family this coming school year and we ask that you join us in this prayer.